Oh, no... not this radio, again... yep, this radio, again.. Of the dozen or so patents on the (brass) badge, the most recent is 1921. So, not a recent invention. But why did it disappear for eighty years? As is typically the case, probably simply due to cost. I admire dave for keeping his autoformer volume control costs down, but they are still an order of magnitude greater than that of a simple resistive potentiometer. But I honestly do not know the modern history. Dave, we both preach about credit where it is due, so who resurrected this idea? My introduction to the inductive volume control came from the pages of Sound Practices and the Ads for the Silver Rock. My interest in the idea was started in the late 90's by Thomas Mayer's praise of an "Autoformer Silver Rock" he had Serge wind for him. With that inspiration, I tried a pair of 2A variacs as volume controls and as wrong as it seems, there was some magic. The discussions on the topic were going back and fourth on the Joenet and it was at this time that I decided to strip some little nickel Lineouts I had and give it a go. Around the same time people were commissioning Sowter to do the same. A short time after that S&B got into the game and then a number of others showed up. 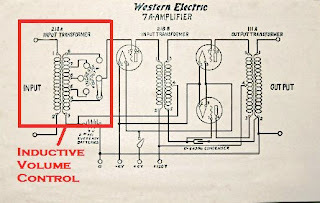 Aside from the Western, Luxman made an inductive control in the 80's and there have also been reports of a few German schematics using inductive attenuation. About 5 years ago I met Serge at RMAF and took the opportunity to thank him for the inspiration and apologize for "stealing" his idea mentioning that I could not afford his product. He simply replied his entry into this area was when he was in college and couldn't afford the Luxman so he wound his own. I don't think the important thing here is who invented something or who did what first. What is important is paying respect to the people who help you generate your direction. Stefano tracked down the Luxman unit. and also found an Ikeda-san unit. That preamp is a thing of beauty! I love it. Didn't Peerless make a multi-tapped auto xformer that was used as a volume control in the '50's? 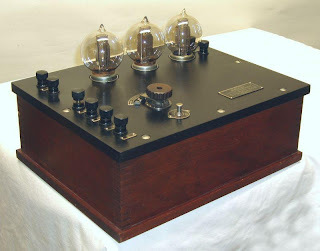 I think it was used in a film-production monitor amp to control the headphone level.